I'm a sucker for split color vinyl for some reason. I just think it's the coolest looking variant you can have. This particular split of brown and white (or 'Chips & Gravy' as they're calling it) is one of my favorites I've seen. I think it's a great combo and it matches the blown out photograph on the album cover quite well. Good job all around on the artwork. 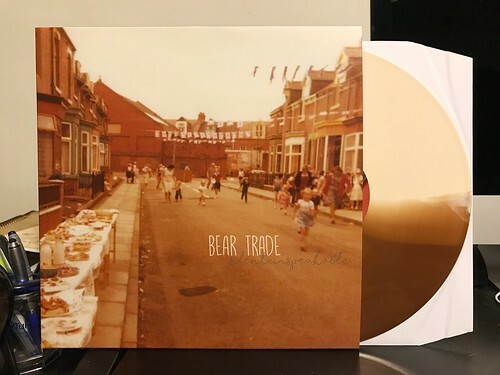 Luckily this isn't just a pretty package with no substance, Bear Trade's sophomore LP serves up another dose of their working man's punk rock. There is also a vibe from this band that is so quintessentially British that you'll never have any doubt as to where these guys call home. In addition to carrying around the influences of some of the UK's best like Leatherface or Hooton 3 Car, they also manage to paint stories in their songs that really drive that feeling home. Comparing Silent Unspeakable to the band's last album Blood & Sand, it seems to me that the songs are slower over all, with more emphasis on storytelling and less concern about being fast or loud. The album has a cohesive feeling as if each song is building on the one that preceded it. In some ways it reminds me of the last Arrivals record. As a whole, I think Silent Unspeakable is the best of Bear Trade and should be a must listen for anyone into melodic UK punk. The Blues Brothers - Expressway To Your Heart 7"
J Church - Racked 7"
Dog Hotel - Dance On The Cake 7"
Superchunk - I Got Cut 7"
The Blues Brothers - Soul Man 7"